Williams Lake, B.C. 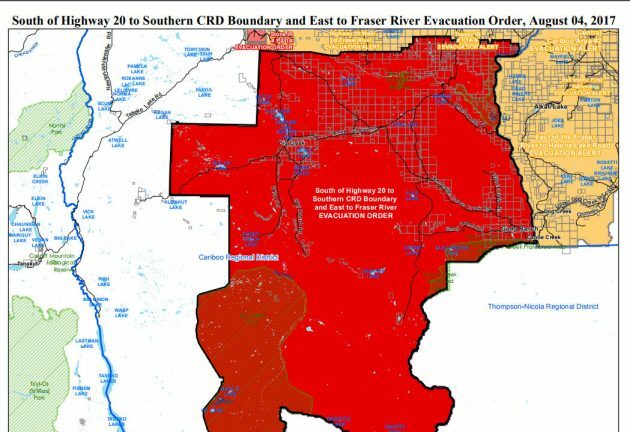 – The Cariboo Regional District has issued an expanded evacuation order for the area south of Highway 20 to the southern CRD border and east to the Fraser River. This is an expansion of the order issued on July 28 for the area south of Highway 20 to Alex Lake and is due to wildfire activity in the region. The evacuation route is Churn Creek Bridge at Gang Ranch, follow Dog Creek Road to Williams Lake. Evacuees are asked to register at the Emergency Social Services Centre in the Resiliency Centre at Boitanio Mall. Those requiring lodging must continue on to the ESS Reception Centre in Prince George at the College of New Caledonia (3330 22 Avenue). CRD chair Al Richmond says the entire evacuation order covers 58 residents. For more information call the CRD’s public information line at 1-866-759-4977.